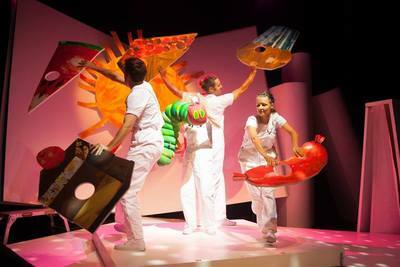 Having only joined the parental set last year, I wasn't sure what to expect for my first foray into children's theatre. 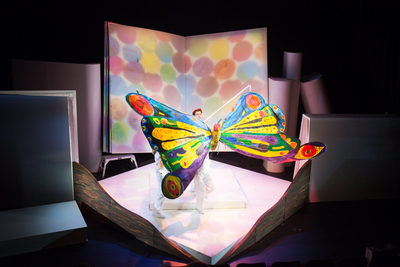 The Very Hungry Caterpillar Show delivers four of author Eric Carle's most popular stories. 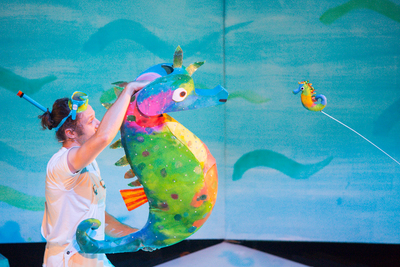 In addition to the greedy grub there is Mr Seahorse, The Very Lonely Firefly and The Artist Who Painted A Blue Horse. The live versions of these books and their characters are just delightful. What seems a simply dressed stage is actually deceptively ingenious. By turning the pages of giant book, the audience is taken seamlessly from the painter's studio, to the seabed, to the night sky and finally to the smorgasbord of the caterpillar. Add the beautifully intuitive lighting and eclectic musical score and these scenes had the audience of all ages mesmerised. 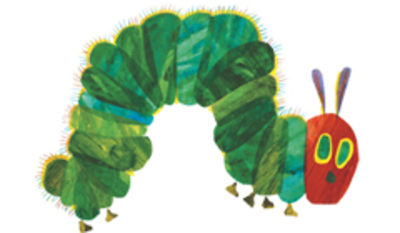 Out of the egg .. the Very Hungry Caterpillar! In addition to the four actors in the cast, there are 75 puppets used to bring to life all Carle's other characters. The bigger-than-life size bear and lion had the children on just the right side of thrilled, as opposed to scared. The aquatic creatures were sparkly and spiky in all their measure and were true representations of the book illustrations. The lion fish was a definite stand out. The tiny lit bottoms of the fireflies bobbing in the dark were just gorgeous, as was the chubby caterpillar puppet that was just begging to be squeezed! The cast provided clear and warm narration of the story and imaginatively voiced their characters. They created a great sense of anticipation and inclusion that the children were enjoying immensely. I believe the true measure of judging if older children are engaged are if they are asking questions, and you could hear all sorts echoing around the theatre about what colour or animal or fish or fruit was coming next? For the tiny folk, my 9 month old included, the lighting, illusions, movement and music had them enthralled and I didn't hear one cranky kid during the 50 minute performance! A testament to the skill, thought and care of the production. 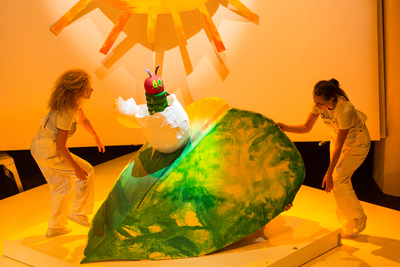 I think the bar has been set super high for my family's future theatre going and I highly recommend going to see The Very Hungry Caterpillar Show. On a practical note, there was room for pram parking and there are very clean baby change facilities in the disabled toilet. Car parking in the area can be a pain so I would suggest using public transport where possible. Huge thanks to Chapel To Off Chapel for inviting my daughter and I to the production. You can find more information and book tickets HERE.